July, 2018 | Liberta Inc. | Liberta Inc.
Heartland Japan was quoted in Tokyo Business Today article! Heartland Japan was quoted in a July 4 2018 Tokyo Business Today article. 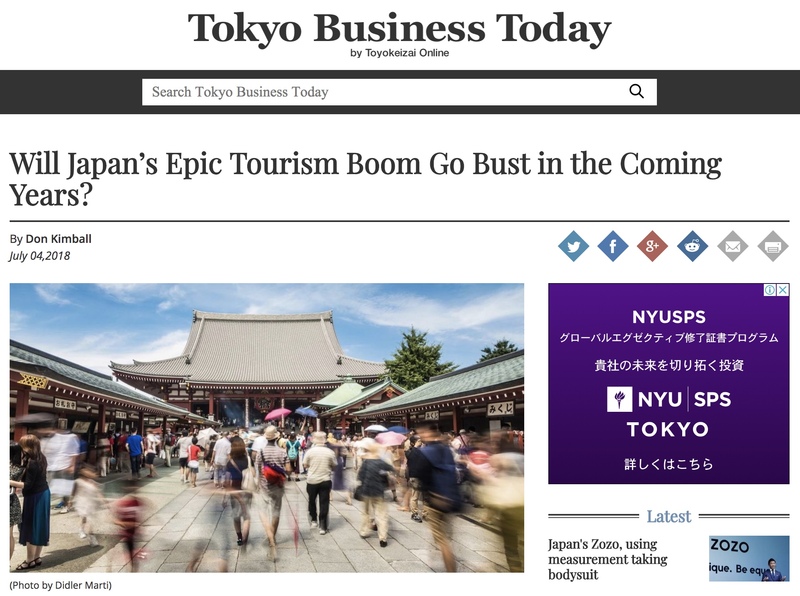 The article explores the question of how long Japan’s tourism boom will last. Japan has experienced an unprecedented inbound travel boom that has grown year on year since 2013. This is no doubt a very welcoming development for Japan but it has not been without its struggles as cities such as Tokyo and Kyoto tackle with the challenges that have arisen, particularly in terms of infrastructure, language as well as cultural differences. The article suggests that Japan is still struggling with these issues and that the tourist-saturated cities’ burden need to be reduced by providing information and services to allow travellers to explore the rest of Japan, outside of the so-called ‘Golden Route’. This is where private travel companies such as Heartland Japan can play a key role. https://liberta-inc.com/en/wp-content/uploads/2018/07/1.jpeg 696 1264 Liberta Inc. http://liberta-inc.com/en/wp-content/uploads/2017/02/liberta-logo-300x75.png Liberta Inc.2018-07-04 13:41:092018-07-04 15:11:18Heartland Japan was quoted in Tokyo Business Today article!